Leading Manufacturer of substation structure from Rajkot. Substation business vertical offers customers a full range of Substation Structures and integrated solutions ranging from design, manufacturing & supply, in the domestic and international markets. 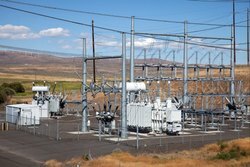 A substation receives electric power from a nearby generating facility and uses a large power transformer to increase or decrees the voltage for transmission to distant locations. A transmission bus is used to distribute electric power to one or more transmission.